When Ashley Amaya took over as editor-in-chief of Survey Practice, the American Association for Public Opinion Research’s e-journal, in 2017, modernizing the publication was her main focus. Among her top priorities for the journal were improving its manuscript turnaround time from submission to publication, in order to make research available faster, and making the online-only journal more interactive for readers. In order to achieve these aims, she sought to move from issue-based publishing to a rolling publishing model, in which articles are published as they’re ready, and to make the journal mobile friendly with the ability to include multimedia in articles. 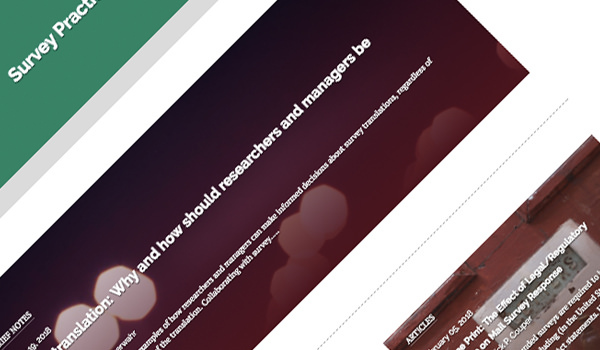 Soon after joining the publication, Amaya realized that finding a new software solution for Survey Practice would have to be the first step towards reaching her goals, as the journal’s publishing system would not allow the editors to publish outside of the traditional issue-based model and did not offer a responsive website design that would work across mobile devices. So she began searching for an alternative journal management platform. She and the editorial team ultimately chose to move the journal to Scholastica, where they are able to manage peer review, publish open access (OA) articles and issues, and have Scholastica typeset HTML and PDF articles for them. Amaya said they chose Scholastica because it had all of the OA tools they needed, allowed them to centralize peer review and publishing, and gave the journal editors the freedom to publish on their own schedule. As a journal dedicated to providing current information on issues in survey research and public opinion, timely publication is one of the most important factors for Survey Practice. In recent years, Amaya said the journal had developed a growing backlog of articles waiting to be published for a variety of reasons that was concerning to the editors. They realized that they needed to get articles to publication quicker in order to offer greater value to readers. “Timely publication is really the purpose of this journal - it is meant to be about what is happening now, so scholars and practitioners can do their jobs better,” she explained. Given the importance of rapid dissemination of new research in the journal’s field, Amaya decided a new publishing model was in order. She sought to transition Survey Practice to a rolling publishing model wherein articles are published as they’re ready and compiled into issues later. Another issue Amaya recognized that was making it difficult for readers to use the journal fully was its website design. The journal did not offer a mobile-friendly reading experience, which was making it difficult for readers to reference the publication when they were not by a computer. Prior to moving to Scholastica, Amaya said limitations to the journal’s previous publishing software were the main barriers to reaching their publication goals. When embarking on a search for a new peer review and publishing system she said her main struggle was that most platforms she found were designed for print publishing models rather than online-focused publishing. “We were having a really hard time finding a submissions management system and a publishing system all in one that would actually allow us to not publish in issue format. It’s one of the big reasons that we went with Scholastica - the option from competitors just wasn’t there,” she said. In assessing their editorial needs, Amaya said they realized being able to have one platform for peer review and publishing was a must for the editors, to avoid having to work between multiple systems. They also recognized typesetting as one of their most time-consuming tasks and sought ways to speed up their workflow. They decided to adopt Scholastica’s typesetting service and have been saving time as a result. For the Survey Practice team, moving the journal to a rolling publishing model and a mobile-friendly website is all part of taking steps to give the publication a more engaging digital presence. Amaya said the team is now turning to social media initiatives to continue their efforts. Amaya said that the Survey Practice team is also working on promoting the journal to undergraduate departments and other types of social science researchers to reach more younger readers and interdisciplinary scholars.